The Vocera Collaboration Suite app integrates voice and secure texting, and lets you call by name, group, or role with automatic call escalation. Vocera offers a comprehensive portfolio of integrated, intelligent solutions to improve communication and workflow for today’s mobile, mission-critical workers, enabling them to securely and instantly connect with the right person, group, or information. Vocera® Collaboration Suite creates a seamless user experience, combining the unique voice calling, texting, notification, content distribution, and sharing capabilities of Vocera into one, secure, and easy-to-use smartphone application. Instantly connecting care teams inside or outside the healthcare facility improves staff productivity, patient safety, and the overall care experience. Vocera offers a choice of end-user devices to ensure the continuous flow of critical communications. 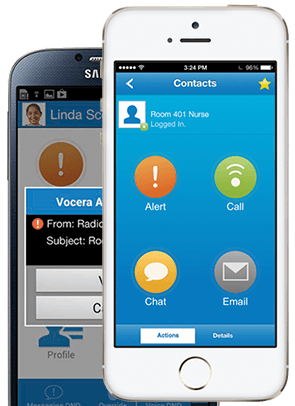 For those clinicians who rely on smart devices, Vocera Collaboration Suite offers the convenience of voice technology with the security to text critical data, and the functionality to integrate with key clinical systems.